The current cost of a CLFR system is approximately US$3000 per kW; we believe it will drop rapidly to US$1500 per kW within a few years as a result of a numerous technical improvements already identified. At a future estimated cost of $1500 per peak kilowatt, this is ($672 - $1456 billion)/0.93 (the 0.93 because we only supplied 93% of power in the case calculated), or about $723 - $1566 billion in capital investment to provide a grid which supplies the great majority of static and vehicular loads. While I have dismissed most claims about Concentrated Solar Power, i am reserving judgement about Mills claims until demonstrations and cost data from actual projects become available. Elsewhere Ausra has claimed that it can deliver its CLFR system @ 10.4 cents per kWh with prices dropping to 7.9 cents in three years. Yet Ausra will not tell us how much its 5 MW Bakersfield demonstration facility will cost, but it is reported that Ausra raised &60 million in October to complete the Bakersfield facility, in addition to the $40 million it raised last year. Investors include KERN Partners, Generation Investment Management, Starfish Ventures, Khosla Ventures and Kleiner Perkins Caufield & Byers. According to Ausra, "confidentiality agreements" prevent it from revealing how much the Bakersfield facility actually costs. Ausra’s Kimberlina (Australia) plant cost $15 million and produces 5.0 megawatts, a cost of $3.0 million per megawatt. Ausra’s planned Carrizo plant, intended to produce 177 megawatts at a cost of $500 million, is estimated to come in at $2.8 million per megawatt. . . . Ausra’s estimated capacity factor, in the only slightly less hot and sunny southern San Joaquin Valley is between 18% and 22%. 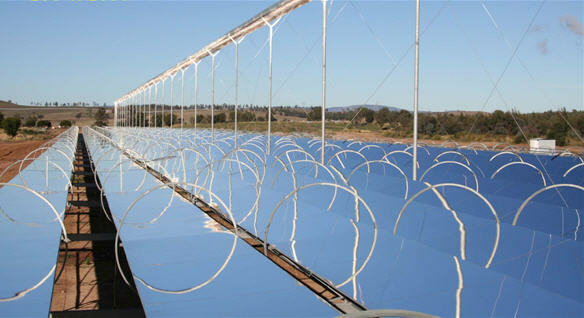 Ausra’s Kimberlina plant, at a slightly lower 1,800 full-sun-equivalent hours per year, but a much higher output of 320 megawatts per square mile in full sun, can generate an impressive 576,000 megawatt-hours per square mile per year. Ausra’s planned Carrizo plant, at full scale, projects a somewhat lower 206 megawatts per square mile in full sun, but that still equates to 370,000 megawatt-hours per square mile per year. . . . Ausra’s Carrizo solar field, megawatt-hour vs. megawatt-hour, will consume literally ten times less land than Optisolar’s Sarnia solar field, should not be lost on anyone considering desirable options for utility scale solar development. This is impressive coming from Ring who is one of the few sober and reliable observers of the renewables field. 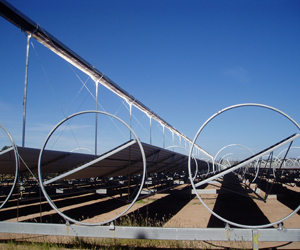 Does Austra's technology represent a breakthrough that is going to make make concentrated solar power a viable replacement for coal, at least in reliably sunny places like the Southwest? We can go to the paper by Austra's David R. Mills (and Robert G. Morgan), and look at the system in greater detail. Mills makes some interesting observations about the generation dynamics of solar power. First the amount of solar heat input into a concentrating system varies by the time of day with maximum heat coming at noon (surprise). Thus if the generator is capable producing 5 MWs at noon it will begin producing 0% of capacity at dawn, will gradually rise to 100% of capacity at noon, and drop off again to 0% of capacity at dusk. Mills and Morgan are so confident of the viability of their concept that they propose to double the heat collection of their system without increasing generator rated capacity. That means that heat input for a considerable pat of the day will exceed the ability to use the heat to to generate electricity at noon. The choice would be to either dump the exra heat or to store it. Storage would be desirable because that would allow power to be generated on demand independently, rather than depending on sun shine. Very low cost water-based thermal storage is expected to be commercialized within two years using (our?) own technology under development. Thermal storage can actually lower kWh cost because it reduces turbine size required for a given thermal output. In STE designs using storage and no fuel, there is long term also immunity from fuel cost rises. How much storage do they need to give overnight base load power? Mills and Morgan claim that by tripling their heat gathering installation they can they could store enough energy to provide 16 more hours of electricity. Thy believe that with this system they can satisfy California's energy demands for most of the year. Winter electrical generation would, however be a problem, with a shortfall likely due to the shorter solar day. In Texas the tripled system would encounter shortfalls during both summer and winter, and the gathering system would have to be quadrupled in order to cope with summer peak demands. So how much is this going to cost? Mills and Morgan are very circumspect about what they tell us. They toss out figures like $3000 per kW with out tying that figure to a capacity factor. I am going to make an educated guess that the $3000 figure is for am around .20 capacity factor system with no storage. Since Ausra’s Carrizo solar field only produces 2/3 the electrical output of the Bakersfield facility per land unit, some energy storage is probably involved. How much? We don't have a hint. Mills and morgan claim technological improvements are in the offing, that will have the cost by KW of output. The most likely way to accomplish this would be by improvements in gathering technology. So either they intend to double energy capture per unit of output through a 33% improvement in capture technology and a 50% increase in land use, or they are going to store a rather modest amount of energy that would allow some power generation on demand. So how much is base load electricity going to cost using Ausra technology. We can start but taking the$3000 figure and calculating the cost of tripling electrical output. That would take us to $9000. Ouch, that would be overnight costs. If we project things out 5 years, inflation would take us to somewhere around $18,000 per kW. Ouch! Ok let us go to the lower $1500 per kW figure with technological advances. Unfortunately we don't know how that figure is calculated. If it is calculated on the basis of the Bakersfield system, that means that Mills and Morgan believe that with improved technology they could deliver the Bakersfield system at half its current price. If this is a claim about the 3x gathering capacity system it would indeed be impressive, but if we assume the Bakersfield facility is the referent then a 3x facility would come to $4500 per kW, about the current overnight costs for nuclear plants. There are some other disadvantages. According to information in the Mills and Morgan paper, the 3x California facility would operate at from a little more than 40% of capacity to somewhat more than 60% of capacity depending on the time of the year. This compares to the average of 92% capacity for todays nuks. Thus at the same price the nuclear power plant with the same nameplate output rating would produce significantly more power over a given period of time. There is an old Jewish saying, "If you are planting a tree and you hear that the Messiah is coming, don't go check on it until you finish planting the tree." Mills and Morgan wrote their paper at a time when they were beating the bushes for money. They had a considerable interest in presenting the best possible case for their product. Yet at the same time, they have a responsibility to potential investors to not misrepresent the risk they might be incurring. They, of course did not mention the taboo word "inflation". That word only applies to the cost of nuclear power plants, and it is absolutely forbidden among renewable supporters to mention inflation in connection to the future cost of renewables, while the same word must always be mentioned in connection with the terrible, horrible nuclear power plants. Mills and Morgan have, of course, honored that tradition. Hay, Kleiner Perkins Caufield & Byers have economists. on staff or under contract They know the score, or at least they should. They should know how to figure things out. Unfortunately, Kleiner Perkins Caufield & Byers' judgement has not been to good lately, and having a would be "soft path" energy provider walk hand in hand through the door with Amory Lovins, might count little to much in their reckoning. We shall see how the Ausra story unfolds. Charles, this is fascinating and important work. The whole movement around Solar needs to be aware of this. 100% capacity exists for only about 4 hours. But the actual numbers are out there someplace. The period in which it goes from 0 to 100 and back down again occurs on either side of these 4 hours...or less. We need to get a true capacity factor because without it, we're shooting in the dark (no pun intended). This is the key number to figure out true costs, and possible revenue to see if solar can *ever* come off subsidies. My own "guess" is that capacity factor is about .16. David, solar capacity factor depends heavily location. Cloud cover plays havoc with solar thermal capacity. That is why CSP in confined to certain parts of the Southwest. It's true, there's a bunch of variables missing for us to do the analysis. Your doubling of the 9000 per kW figure not correct. If a 5000 per kW nuclear plant takes ten years to build, you don't triple that either do you now? Capacity factor is quoted as 18-20 percent which seems correct for a good location and some downtime for maintenance (cleaning the mirrors can be done in the evening). Calculating levelised cost is pretty easy. 1/capacity factor * dollars per Watt + production cost (including grid integration/intermittency cost). So the Ausra plant is probably around 15 cents per kWh. More expensive than new nuclear in the US, but not by a large factor and they're only just starting up, with a small inefficient plant. Small steam turbines are inefficient. Going and order of magnitude bigger should help a lot. Besides there's a reasonable correlation with peaking needs in California, which can cost more than twice the 15 cent/kWh figure. But we'll see. At least they've got a plant running now. I'll remain cautiously optimistic. Cyril R, I would not think that my analysis would be the final word. In the first place I am working with very limited data, and I would prefer that someone with more professional training do this. As far as I can tell, no one is right now. I am assuming 100% inflation in the cost of new generating facilities by the middle of the next decade. This is assumed by critics of nuclear power. In order that the playing field be leveled the same assumptions need to be applied to renewables as well. The principle is simple, everyone should play the game by the same rules. I calculated that the cost of nuclear in 2015 to be $8 Billion per GW, ,and by 2020 to be as much as $12 billion per GW, not $5 Billion as you wrongly surmised. solar. however the cost of the grid upgrad for solar would be higher because the adveraged distance between the power production facility and the grid would be longer. Nuclear facilities can be located to take advantage of existing grid hookups for coal and gas fired power plants. Your assumption ofa 10 year construction period for nuclear is off. Once the NRC issues the first licence for a nuclear facility design, all subsequent licenses will be based on the first license. That means a substantial cut in licensing time. Secondly, Westinhouse has developed 3 year construction schedules for the AP-1000. That means that within 3 years of the first turning of the spade, Westinghouse expects power to be coming from their reactors. Thirdly many NRC license applications are geing issued for multiple reactors, that means that two or more reactors will be built at the same time or sequentially. Thus as many as 3 reactors can be completed at the same site within ten years. Fourthly Westinghouse is developing a new fuel technology that will allow it to uprate the AP=1000 by 50% at little additional cost. This technology will mean that two new uprated Westinghouse reactors will have a power output equal to what three of there existing reactor design produces. After 2020 no coust comparisons are possible. Your estimate of the probable cost of Ausra technology is a guess. Against it is the fact that Ausra hasn't revealed the cost of their Bakersfield facility, and I take that to be a bad sign. Well, it's not clear that nuclear should suffer such large inflations, it's probably anti-nuclear groups poking around. Cost may go up a bit more but 12 billion seems unlikely as a fleet average cost. 5-8 billion looks likely to me (2007 USD) based on recent project costings. And for solar thermal costs aren't projected to increase much at all, since commodities prices (steel, concrete) are dropping from the record high levels we've recently experienced. Solar thermal uses more commodities per Watt than nuclear so that appears a relative benefit to solar thermal. If apples are projected to be twice as expensive in five years, does this mean we should assume oranges to do this also? Apples are not oranges just because both are fruit. Hence the saying. What we need to know is: what are the primary mechanisms behind powerplant inflation? What are the differences between coal, solar thermal, wind, and nuclear? I read somewhere that the system efficiency of the 5 MWe plant is only 20% or so. Going two orders of magnitude bigger in turbine size results in 50% more system efficiency at least (30% net). So that should cut levelised cost at least by one third. I based my estimate on 20 years life and 10% discounting. Which is a bit conservative. 18 or 20 percent capacity factor is an often quoted number for this technology, without storage. And they made it clear that the 5 MWe plant has not substantial amounts of storage. Capacity factor may change a lot in a poor solar location, but that's not where these plants should be built. Production costs are not clear to me. From other solar plants, washing the mirrors and replacing some parts shouldn't cost more than half a cent per kWh, but we could double that to be conservative. So 15 or 16 cents can't be much more than 10% off. This looks like affordable peaking power for much of California, so it looks like they have some market there. Cyril, I don't have a crystal ball. The inflation relationship holds for all power sources. If you assume high inflation for nuclear, it is very unlikely that you will see low inflation for renewables. Current inflation estimates for nuclear may well be running too high. I am going to assume the high figure because that is what the anti nuclear activist argue, and I am quite willing to hang them on their own roap. Your assertion about Solarthermal prices would not hold in an economic recovery, especially if the economic recovery returned China and India to the levels economic expansion they enjoyed during the last few years. The inflation expectations for all renewables prior to the economic downturn was unrealistic. Between 2002 and 2007 all renewables inflated in lockstep with other generation technologies. It is an intellectual error to assume high inflation for nuclear and low inflation for renewables, unless you can demonstrate a strong reason for making the assumption. Apples and oranges won't cut it. With nuclear efficiency is a function of technology more than size. Small PBRs and LFTRs operating at higher temperatures are more efficient than the largest Light Water Reactor. Finally by going to new nuclear technology, the nuclear industry has a tremendous chance to lower costs. See my keys series inthe may archive.